iJET – AT Information – Innovative Marking Systems, Inc. The iJet: Features smart coding with HP technology including iLOGIK and OLED that permit the selection of hundreds of labels plus the option of operator-entered variable data such as lot or batch codes. Special inks are available to dry on non-porous substrates. The head and controller are embedded in a compact metal housing that fits in small spaces on packaging lines or in automatic cartoning machines. Suited for quick and clean printing on product surfaces in the food, pharmaceutical and consumer goods markets. Cartridge insertion is simplified by the unique Click’n Print holder. Features such as the iLOGIK-system control and the high resolution display, facilitating the input of parameters and variables as well as complete menu navigation render the iJET particularly user-friendly. 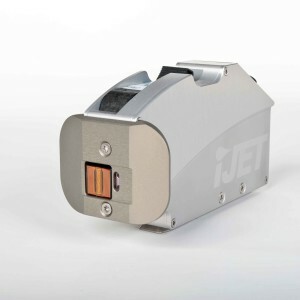 Depending on the coding requirements, the iJET comes in four different versions: Print, Basic, Advanced and Pro. The Pro version enables database connection, HiSpeed mode, password options and configurable inputs and outputs. Nothing is impossible with the iJET Printer: product names and descriptions, quantities, production dates, lot & batch codes, serialization, logos, barcodes and more. Printing can be accomplished from all sides and directions except printing up. Optimized product identification with built-in photo sensor. Controller on board multi-tasking system. Animated graphics for simple operation. Programmed ink types to optimize porous and non-porous substrates automatically. Speeds at 300 DPI vary by iJET version (from 30 m/min to 180 m/min).